Charmaine Mercer has focused her career on education policy, practices, and tools that advance outcomes for those furthest from opportunity. 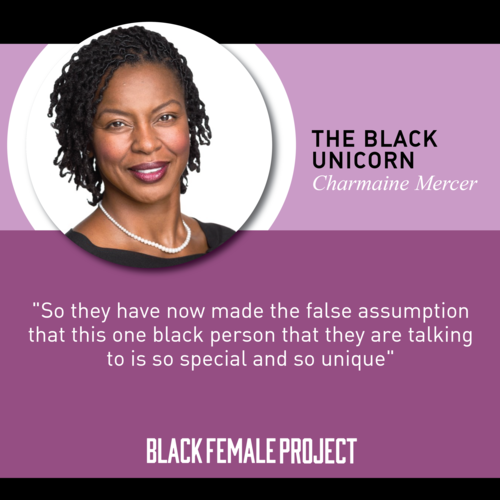 In The Black Unicorn, Charmaine talks about facing racism in the workplace and how it affected her career advancement. All of the women who share their stories in our inaugural collection have found themselves in a battle for sanity, cultural autonomy, or simply professional courtesy. These women have also found their own strategies of success; some are still developing these methods and share their experience with us in real time. Let’s join them now. I am Charmaine N. Mercer, a mother, wife, and daughter, sister, cousin, and friend to many. I live in Long Beach, CA. My vocation is to help ensure high-quality educational opportunities for all children, but especially those who are furthest from opportunity. In my current role as a program officer for William and Flora Hewlett Foundation, I am able to use philanthropic funding, combined with my knowledge and experience of policy and practice, to help advance my vocational aspirations. It’s hard to say just one thing. If I had to choose, it was the ability to reflect on my professional journey and realize how much I have experienced and grown from these experiences. I rarely take time to reflect, so that was nice. I would tell her “Be You.” Just two words. I even tattooed them on my body to remind myself.